In the days since the terrible events of September 11, the German people have spoken with words, flowers, candles, donations, and with their hearts, of their affection and support for America during this difficult time. The U.S. Embassy in Berlin and Consulates General around Germany have received tens of thousands of expressions of support and encouragement. I have been deeply touched by this response from our German friends. Their response to tragedy has confirmed once again the bonds of friendship that unite our two nations. That friendship and mutual support will be essential to success in our common struggle against terrorism. On behalf of the people of the United States, I would like to express our heartfelt gratitude. Thank you. "In the past few days there has been much talk of gratitude; yes, even about a debt owed particularly by us Germans to the Americans who stood by us for 50 years. This is no doubt correct. But if it were only that alone, it would not endure. True friendship is nourished by gratitude, but not by gratitude alone. True friendship is nourished by its sustainability for the future." CDU Chair, Dr. Angela Merkel. German Bundestag, Berlin. September 19, 2001. "John F. Kennedy once said, 'Ich bin ein Berliner.' By saying this, he expressed the responsibility of his nation for ensuring Berlin's freedom. Now, decades later, we say, 'We stand firmly at the side of the United States,' -- this is our contribution to ensuring peace and freedom in the world." FDP-Chair Guido Westerwelle. German Bundestag. Berlin, September 19, 2001. "September 11 was not only a human tragedy. It marks a turning point in world politics and is a symbol of the unprecedented challenges posed by international terrorism and an international solidarity that hardly seemed conceivable before. Just as 1989 marked the end of the 20th century, September 11 may be the starting point of the world order of the 21st century." Bavaria Minister-President Dr. Edmund Stoiber, CSU-Chair. October 12, 2001. "The images of the collapsing World Trade Center towers triggered a worldwide state of shock. When it was evident that some of the terrorists had lived in Germany and made essential preparations for the attacks from this country, it became abundantly clear that even our free, tolerant, cosmopolitan society is assailable and vulnerable. We have repeatedly been aware that the terror attacks were not directed against the U.S. alone. Paris or Frankfurt, London or Berlin, could just as well have been hit." CDU/CSU-Bundestag Chair Friedrich Merz. German Bundestag. Berlin, November 8, 2001. "11 September thrust a dangerous future upon the world. We now live in the terrible knowledge that no country in the globalized world is invulnerable, and that enemies within, who are determined to kill and to die, can perpetrate mass murder at any time. This eerie, awful danger has at a stroke dramatically altered the foundations of security policy as we know it." German Foreign Minister Joschka Fischer addressing the United Nations in New York. November 12, 2001. "We share the conviction that we have to do everything possible to prevent crimes like the ones in New York and Washington from ever happening again..."
German Minister of the Interior Otto Schily. Press conference with US Justice Ashcroft. Berlin, December 14, 2001. 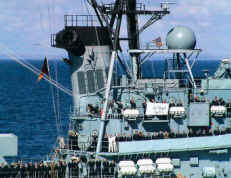 At sea, a German destroyer paid a U.S. Navy ship more than honors. Three days after the attacks, the GFS Lutjens came alongside USS Winston S. Churchill while the ships were operating together. Members of the Lutjens crew, in dress uniform and holding a sign which read We Stand By You, showed their support and solidarity with the United States. in my entire life, and more than a few of us fought to retain our composure. Its amazing to think that, only a half-century ago, things were quite different and to see the unity that is being demonstrated throughout Europe and the world. It makes us all feel proud to be out here doing our job." Top: Over 200,00 people attended the demonstration of solidarity at Brandenburg Gate on September 14. Some participants came wearing shirts with the inscription �Ick (sic) bin ein Amerikaner�. Bottom: German Navy destroyer, the GFS L�tjens. September 14, 2001.